Anyone who has experienced the New York City subways knows the extensive nature of this transit system. The subway system is also full of fascinating history. Subway cars are one of the main aspects of this transit system that has changed over time, although even the subway lines have evolved from being separate to being combined in 1953. NYC tours by subway can be an exciting way to experience the heart of New York. In the late 19th century, elevated trains were introduced onto the streets of New York City, offering patrons a new way to navigate the city streets. These trains were a replacement for trolleys and horses and carriages. The trains were steam-powered, and they were made of wood. The legendary blizzard of 1888 was the impetus that led city officials to begin seriously planning an underground subway system. On October 27, 1904, the Interborough Rapid Transit Company (IRT) opened the first underground transit with a line between old City Hall in lower Manhattan and 145th Street in Harlem. A short time later, the Brooklyn Rapid Transit Company (later changed to the BMT) began operating wooden cars underground that had previously served as elevated trains. When a crash occurred in a subway tunnel in 1918, this service ended abruptly. The composite cars belonging to the IRT had wooden bodies that were covered in a layer of copper. The coaches featured fabric seats, and the cars were pleasingly spacious. The conductor had to open and close gates in each station manually for riders getting on and off. In 1910, the subway cars were updated to include an extra door in the center. In 1915, the IRT introduced Pullman-style cars made of stainless steel. Over the next 22 years, at least eight other car styles were introduced. Seats remained fabric-covered, and one modification was to create more standing room in the cars. Also in 1915, BMT introduced the Standard, which was a wider and longer subway car with a steel body. These cars featured more standing room, larger windows, and brighter lights than the IRT ones. The Independent Subway System (IND) debuted in 1932 as New York City's official subway. The IND subway cars were similar to BMT cars and larger than IRT cars. Tunnels of varying sizes were required to accommodate these cars. R-type IND cars, also called "City Cars," had a combination of the fast speed of IRT cars and the larger capacity of BMT cars. These cars were a dull green in color, and they were the first ones to feature four doors on each side of the car, which was helpful for speeding up the loading and unloading process. By the 1950s, New York City had purchased the private IRT and BMT lines, combining the three different services into a single New York City Transit Authority. Additional R-type cars had been introduced over time, but the biggest modification to subway cars was air conditioning. Introduced in 1950, the R-15 car was the first air-conditioned subway car. Two unfortunate issues with the air conditioning system were the dampness inside the cars and water dripping on passengers. Eventually, air conditioning was eliminated from the cars, to be replaced with fans that were easier and less expensive to maintain. Finally, in 1966, a fleet of subway cars was introduced that had fully functional air conditioning. During the 1970s, the subway system and subway cars changed little. Maintenance on the existing fleet also suffered during this decade. During the 1970s, the R-44 and the R-46 were introduced, featuring plastic seats. This was also the era in which graffiti artists discovered subway cars as an ideal medium for their messages. New innovations during the next decade spurred the introduction of more reliable cars that are still in use today. The New York City Metropolitan Transit Authority launched an initiative designed to eradicate graffiti on cars in 1984. On May 12, 1989, New York City announced the successful removal of all graffiti from subway cars. The current law states that trains cannot run if graffiti is present on the exterior of the cars. Subway cars have taken a giant leap forward in the 21st century. In 2000 and 2002, a new class of cars was rolled out including electronic maps and enhanced public address systems. In 2005, the R-160 car was introduced with LED displays of stops and new systems to show time and route information. The R-188 fleet was introduced in 2013. Although New York City has continued to release new cars with enhanced features, the fleet still feels outdated when compared to transit lines in other countries. Plans for introducing more than 1,000 new subway cars are in the works with a target date of 2023. This fleet will have upgrades such as Wi-Fi, USB ports, security cameras, door open alerts, LED headlights, color digital displays, and an open gangway design. The New York Transit Museum opened in 1976 and was initially planned to be a temporary display. The museum was so popular that it became a permanent fixture in the city. Entrance to the museum is in downtown Brooklyn at an old subway stop. The hands-on displays invite visitors to explore historic subway lines with turnstiles, a decommissioned platform, subway cars, MTA buses, and even old subway ads. The museum keeps varied hours Tuesday through Sunday with a nominal admission fee. New York City Transit: History and Chronology: Transit routes in New York City were initially managed by private companies. A Brief History of New York City Transportation: The first bridge of New York City was the King's Bridge, connecting Manhattan with the current-day Bronx. A History of New York City Transportation: From Horsecars to Helicopters: Officials estimate that about half of the people who navigate New York City ride public transportation underground. Early Rapid Transit in New York: Elevated trains in New York City were operated by steam engines that pulled the cars. The Biggest Moments in NYC's Transit History: Horse and carriage was the first form of public transportation in New York City, starting in the 1820s. Public Transit in New York (PDF): The New York Metropolitan Transit Authority transports 140 more people per capita than Los Angeles, which has the next largest transit system. New York Transportation (PDF): An estimated 7.6 million people ride the subways and buses daily in New York City. New York's Lost Subways: New York subways cover 842 miles of track, including numerous tunnels and platforms that are not being used now or were never used. 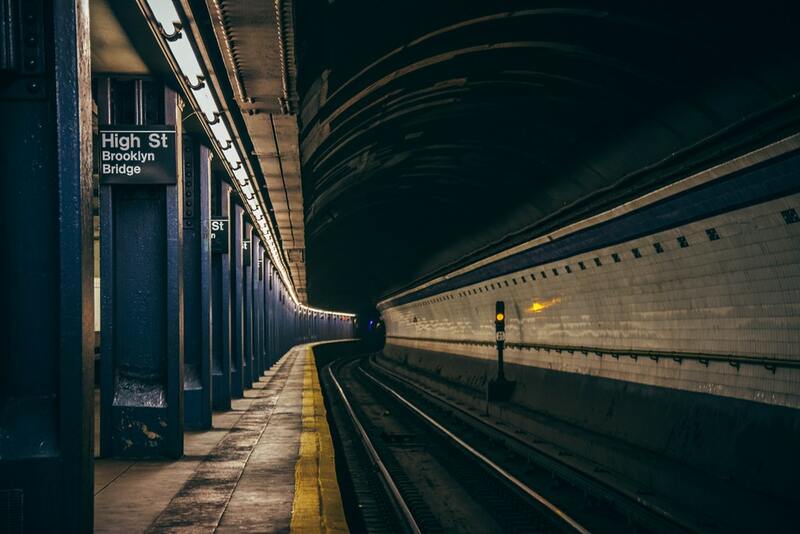 12 Secrets of the New York Subway: A number of secrets exist within the New York subway system, such as the city sinking retired cars in the Atlantic Ocean instead of sending them to landfills. MTA New York City Transit Fast Facts: The Metropolitan Transportation Authority is run by New York state, not the government of New York City.